A few weeks ago, my wife Tina had been down in the Old Port earlier in the day with our boys on a shopping trip. Usually the boys could think of nothing that would be less appealing, but she told them they were going to be in the neighborhood of Standard Baking Company and that perhaps they would stop in for a pastry. That was all it took, and they were happy to make the trip. At the bakery, everyone got to pick out something delicious to bring home. Tina decided to surprise me with something she had never seen before, a pastry called a gibassier. Later that day, as things settled down, I opened up the bag and pulled out my treat. It was this odd shaped pastry, made of a light, buttery dough. However, at the first bite, what jumped out at me was the anise flavor. Anise can be a bit of a polarizing spice. It has the flavor that most people associate with licorice, and tends to be something you either like or you don’t. I have always enjoyed the taste, but Tina, not so much. However, she took one bite of the gibassier, and was impressed. As she turned to walk away with the rest of my treat, she mentioned how she had to find a recipe. After looking it up, we learned it is a traditional pastry from the Provence region of France, flavored with orange blossom water, candied orange peel and anise. I was so impressed by this anise-orange flavor combination, I knew I had to try it in our infusion series. The other infusion we will have on this weekend is basil. We made this infusion a few weeks ago, and it was delicious. I was wandering through the farmer’s market this past Saturday, and the basil just looked so good, I knew I had to do it again while I can still get my hands on this herb at its peak. We will be pouring these beers this weekend, in addition to Eddy, Blaze, Wanderlust, and Burnside. As we have only one line dedicated to the infusions this weekend, they will not be on at the same time. We are not sure which will be available on any given day, but we hope it is the one you wanted to try when you come by. We look forward to seeing you in the tasting room this weekend. 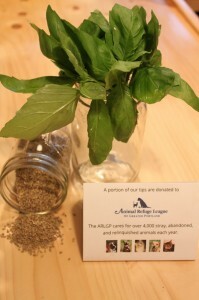 If you haven’t noticed the sign, we donate a portion of all tips received in the tasting room to the Animal Refuge League of Greater Portland. We appreciate your generosity and the opportunity to visit the shelter every month to bring in the donation. Tina likes to get her kitty fix. Hamp, our Golden Retriever, is not too fond of cats.